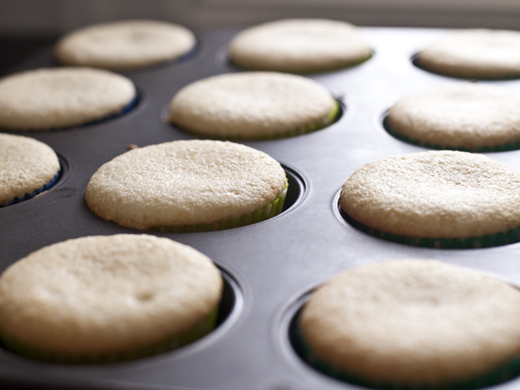 This cupcake recipe manages to be light, fluffy and moist, all at the same time. It starts with a true all-American white birthday cake. The recipe is made with whipped egg whites and no yolks, so the color is bright white. 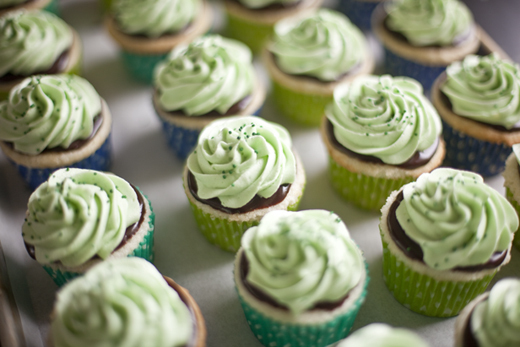 It’s perfect for adding color, but this time I left that to the mint icing. 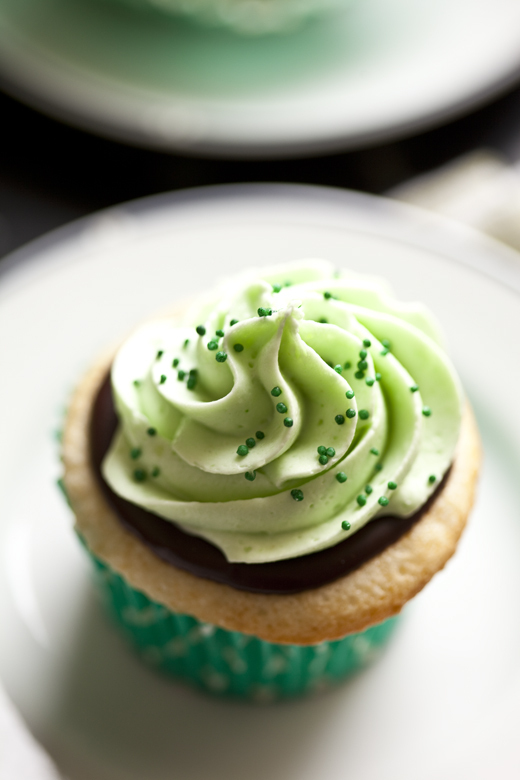 A thin layer of ganache between the cake and icing makes these just a touch more sophisticated, in case you are looking for a St. Patrick’s Day treat to bring to work. 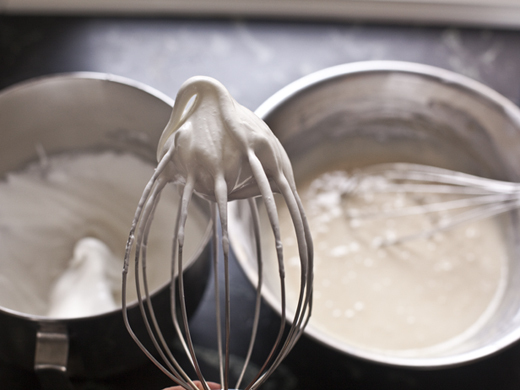 The super creamy icing is one that I made from Vintage Cakes, an adorable addition to my cookbook collection. 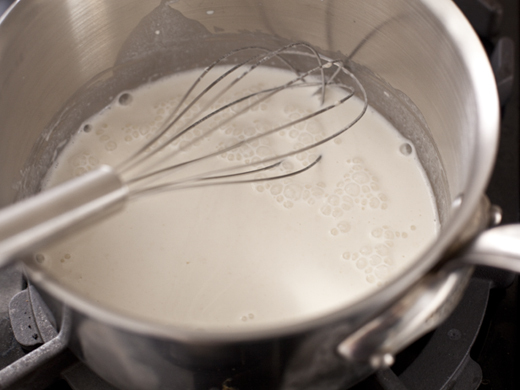 It is made by thickening milk and flour together into a smooth paste, then adding it to creamed, sweetened butter. 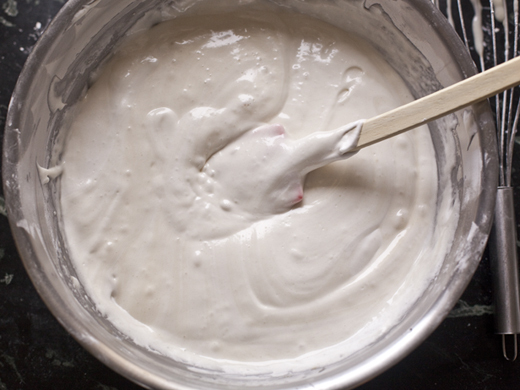 The thickened milk and flour gives the icing body and a luxurious texture. Despite the extra step, it is an easy recipe, my 11-year-old made it start to finish with perfect results. 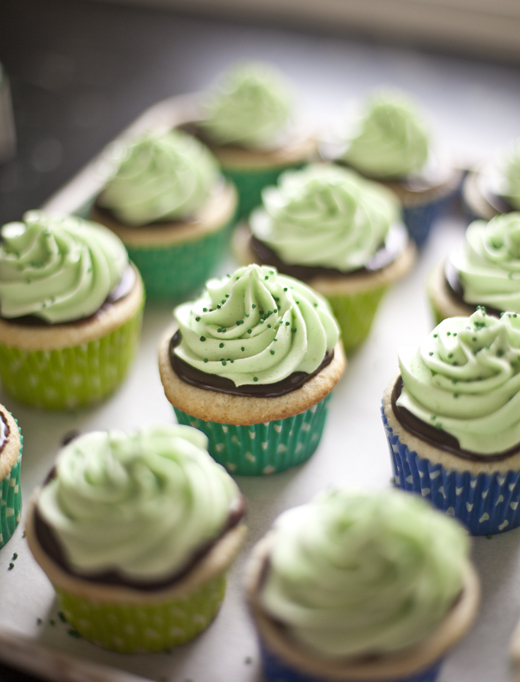 The basic icing takes flavors really well, so a bit of mint extract and a few caps full of Crème de menthe and these cupcakes taste just like a thin mint. 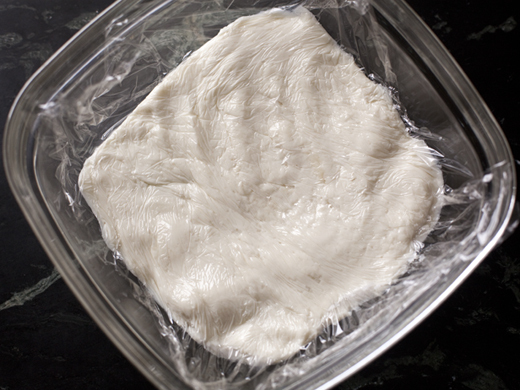 2 3/4 cups (8 ounces) sifted cake flour – sift the flour into the cup when measuring, not after it’s measured. 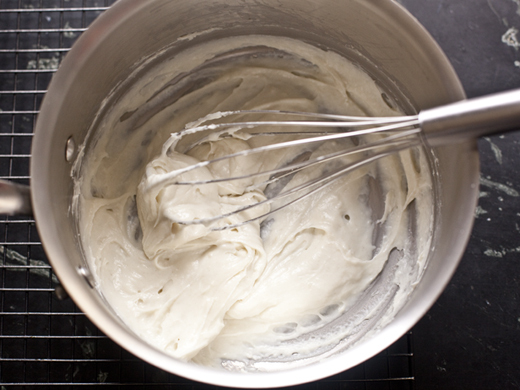 Whip the egg whites in a clean bowl until foamy, then gradually sprinkle the remaining sugar over them and beat until eggs are soft peaks. You can see in my picture that they will not droop off the whip when lifted out of the egg foam, but they won’t have a stiff peak either. 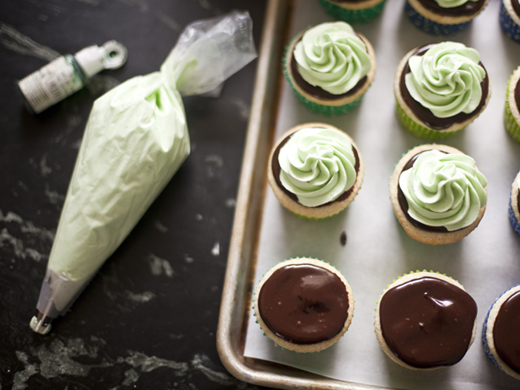 Once the ganache has set, fill a pastry bag, fitted with a large star tip, with the icing and decorate the cupcakes. 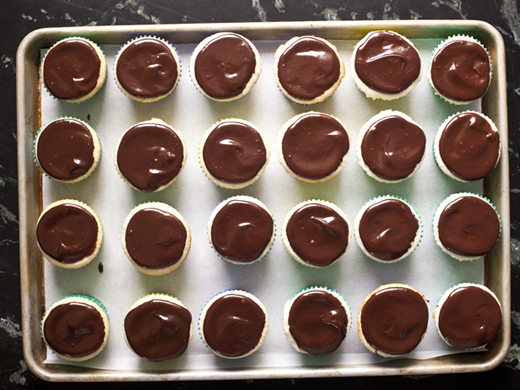 Leave a bit of the ganache showing under the icing. This is soooo tasty looking! Beautiful! 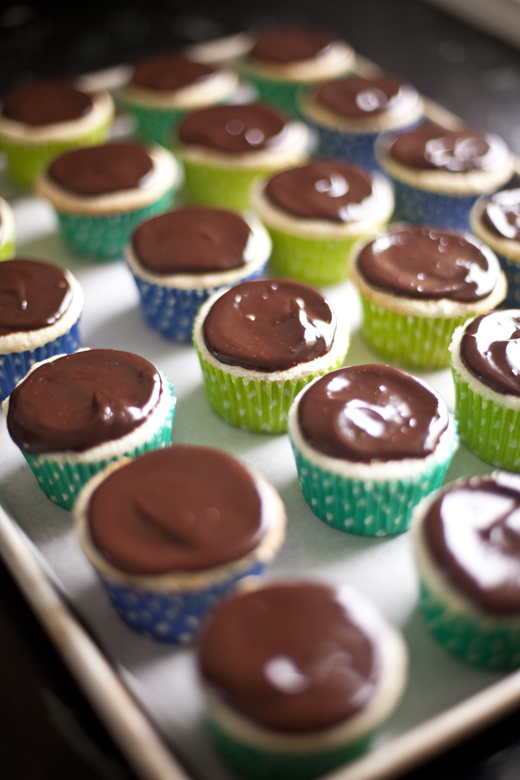 Can’t wait to make these, I just bought a box of thin mint cookies from a girlscout’s Mom. She made me do it. ( LOL) I keep mine in the freezer. 1. To hide them from everyone else and 2.They taste so much better like that. These are so beautiful! The Thin Mints were my favorite Girl Scouts cookies – and one of the only things I liked about Girl Scouts, the cookies and the S’Mores. I’ll be these beauties taste fabulous! 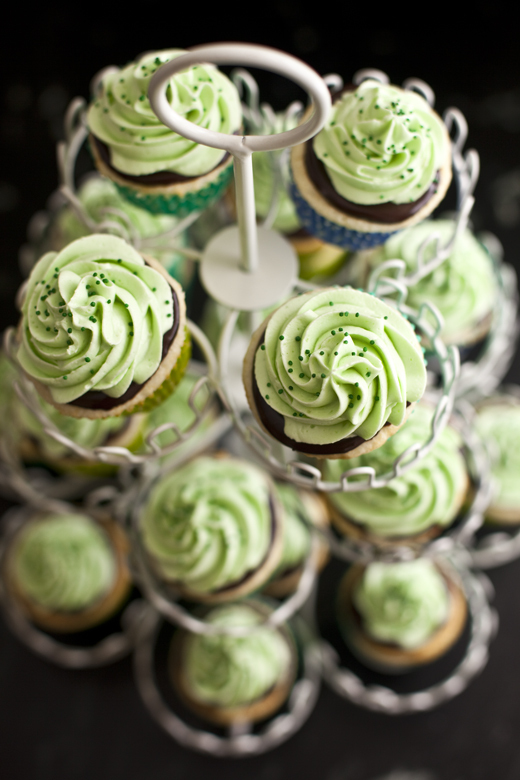 I’d even celebrate St. Patrick’s Day for a couple of these cupcakes! 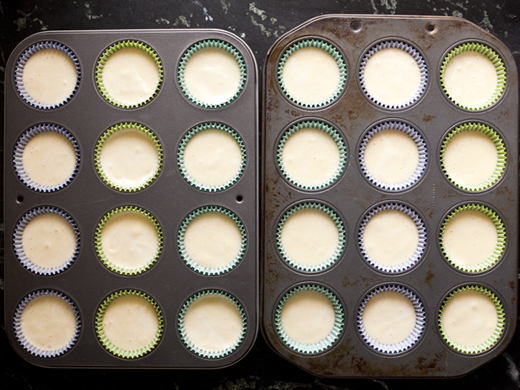 Generally the mini cups will take 1/3 the amount of batter, so this recipe should yield about 72 mini cupcakes. 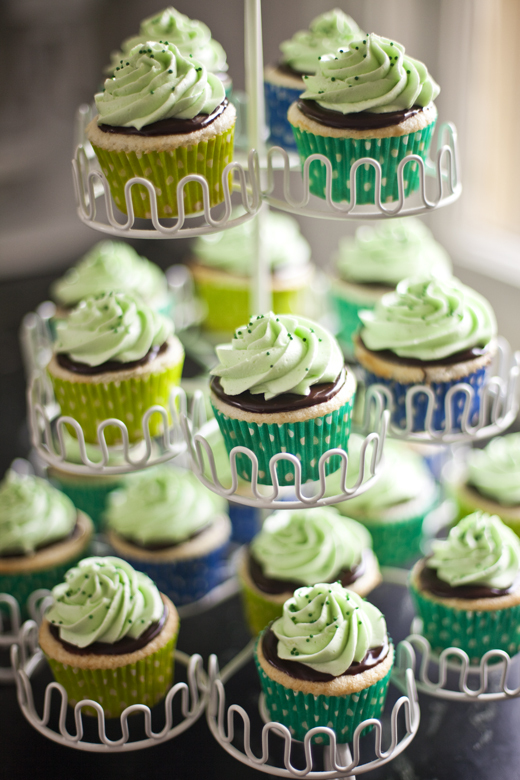 Just made these cupcakes…SO delicious!! Very fun to make too! I haven’t even seen any Girl Scouts this year – I think I go to the store too late for them. This might be a good compromise! Zoe! Oh how you have inspired me! I was looking up cake ideas via pinterest and stumbled onto your website. I love, love, love it! You make things so easy to learn and I love the lay out of your site. I have tried to find other baking blogs and nothing compares to yours. Lovely work and I love the videos too! I’m sorry, what’s half-and-half and Crème de menthe? I’m from Uruguay and i haven’t heard of those before.. Thank you!